Is your jewelry stored in multiple boxes, baggies and various "hiding places" in your bedroom? If so then you have probably thought that "there has got to be a better way to organize all of this" And you are right; a jewelry armoire is the perfect solution to the challenge of storing your jewelry safely and conveniently. Let's take a look how you can take advantage of this kind of storage. First of all, a jewelry armoire is a free-standing cabinet specifically designed to hold a large collection consisting of both fine and fashion jewelry. With individual compartments, ample drawers and generous necklace doors, they are designed to house entire collections, eliminating the need for multiple boxes, baggies and hiding places. In case you are wondering how to organize your jewelry in your new armoire, you can follow my step-by-step approach. The first step is to sort your jewelry. Take everything out and get set to re-organize your collection. Lay all your jewelry out on a large flat surface. Untangle all necklaces and chains and then start sorting: Go through each piece one by one and decide if it's worth keeping. As you go through the items, ask yourself these questions: How often do I wear this? When was the last time I wore this? Is it still in style? Is it in good condition? Based on your answers you can then put the items in piles, bags or boxes with these labels: keep, donate, distribute, discard. The next step in the organizing process is to separate the jewelry. Remove any items that are broken, that need to be repaired or that you just don't want. Consider handing down costume jewelry to children for dress-up or to start their jewelry collection. Group your fashion jewelry by color to make it easier to find the perfect accessory when you are short on time and forced to "grab and go." As long as you are turning over a new leaf and getting your jewelry nicely organized, the next step is to clean your collection. Take the time to clean everything so that you will be sure your beautiful pieces are sparkling when you are ready to wear them. If you're not sure how to clean certain types of jewelry, check out our past blog posts for detailed care and cleaning instructions for different jewelry settings and stones. Some jewelry can be harmed by water or by chemicals found in commercial jewelry cleaning solutions, so be sure to research how to clean your particular type of jewelry before you begin the cleaning process. When in doubt, use a dry, soft cloth. When you have finished sorting, separating and cleaning your jewelry you are ready to store everything. Armoires are lined and particularly suitable for silver jewelry, however, to help keep silver jewelry tarnish free make sure the pieces are not touching each other. Jewelry should be stored the way it's worn. Hang the necklaces, and store items with space around them to keep them from getting tangled, tarnished or chipped. Reserve the top section and top drawer of your jewelry armoire for your favorite pieces and collections. Then, fill up the remaining drawers and swing out sides with your newly organized jewelry collection. There is usually one deeper drawer in a jewelry armoire, and you can reserve this one for chunky pieces and bangles. Utilize the small square compartments for earrings and brooches, store rings carefully in the padded ring rolls. 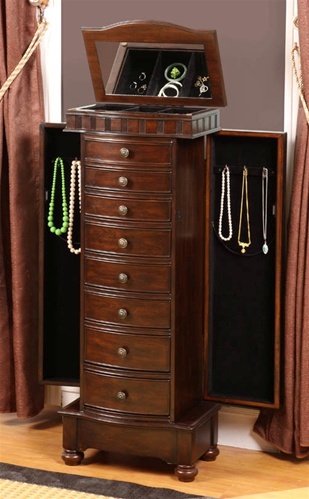 Necklace sides on jewelry armoires are generous and allow easy and accessible necklace storage. When you finish this process you will have a well-organized jewelry collection that is visually appealing and conveniently arranged, making it possible for you to easily find that perfect accessory, either by color, style or finish. Looking for a perfect gift for someone that loves jewelry? Consider a jewelry armoire, they'll be thrilled! Brides have the hard task of finding the perfect piece of jewelry to complement their gown and yet stand on its own too. You want to find something that is noticeable but doesn't take away from the beauty of your gown. It can be a tricky process to find the right jewelry for your special day. One style of jewelry that has become very popular for brides on their wedding day is illusion pearl necklaces. Illusion necklaces are strung on clear strands of string. Designers are creating fabulous necklaces with intricate designs or multi strands that seem to just become part of your skin since you cannot see what is holding it together. These illusion necklaces can be found in traditional white pearl designs and various other pale colors. They are made with simulated pearls, faux pearls, freshwater pearls and saltwater pearls. You can wear a single strand of illusion pearls or purchase a multiple layer necklace to really compliment your dress's neckline. You can find just plain strands of illusion pearls or strands with crystals, colored gemstones, diamond and / or rhinestones that accent the pearls beautifully and give you a bit of sparkle and shimmer in the lights. To go along with your illusion pearl necklace you will want to pick up a pair of matching pearl stud or pearl dangle earrings to go along with it. If desired you can wear a matching pearl bracelet but please wear it on your right wrist and not the left wrist as you don't want to take any attention away from your new wedding rings. Selecting a lovely illusion pearl necklace will enhance the beauty of your wedding dress and you can still wear it for other occasions. As with any delicate jewelry, store your gorgeous piece in a lined or hanging jewelry box so it is ready for the next time that you want to dazzle and dress to impress. Our wedding season promotion is here! Chances are you know someone getting married or celebrating an anniversary this season. To help celebrate these joyous occasions with meaningful gifts, we invite you to enjoy $25 off orders over $250. Enter the promo code weddings and the discount will be applied to your order total. Jewelry Boxes make perfect gifts for husbands, wives, fiances, bridesmaids and groomsmen and flower girls! We love to wear natural stones in our jewelry and accessories. Some stones are very delicate and need special care when cleaning. Marcasite is one of those stones. Marcasite a semi precious stone consisting of pyrite. True Marcasite is actually a mineral called white iron pyrite. In Marcasite jewelry, pyrite used as a gemstone is termed "marcasite". It is considered a stone but because of its structure and should never get wet so you should remove your jewelry before bathing, showering or swimming. To clean Marcasite jewelry you will need a very soft brush and a jeweler's polish cloth. Use the brush to loosen debris and dirt and then use the jeweler's polishing cloth to remove residue and finger prints from the Marcasite stones. Most commonly, Marcasite is set into sterling silver or silver metal when used in jewelry and you should use a soft anti-tarnishing cloth to polish the silver setting when needed. Take care in using treated cloths or commercial silver cleaners as you do not want to accidentally apply any chemicals to the stones. 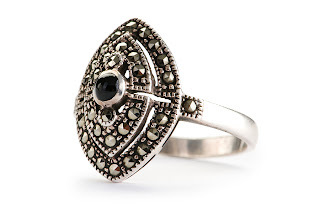 The most important things to remember when it comes to Marcasite jewelry is to not get it wet and to keep your marcasite jewelry from coming into contact with lotions and creams. Don't immerse your Marcasite jewelry in water, expose it to extreme temperatures or clean it in a sonic jewelry cleaner. Take care to regularly clean the stones and settings with a soft brush and soft jewelers cloth. If you take these precautions, your jewelry will look fabulous and be loved for a long time. Rings are such an easy and fun accessory for any outfit or style. They are perfect to mix and match with your other jewelry. They are easy to care for and super easy to store in small or large jewelry boxes. Some of the beautiful trends we are seeing right now are Stack Rings in mix and match gems. Skinny stack rings that you can buy come decorated in colorful gemstones or diamonds and they create such a lovely statement when stacked on your fingers in multiples. Wearing them 3-5 high with mix and match gems is a very elegant look. 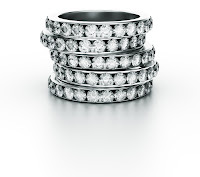 The skinny width allows for the multiple rings to stack on without getting too overbearing. Mixing emeralds and sapphires or rubies and diamonds or rhinestones would be amazing. Investing in beautiful jewelry like this will stand the test of time and can be worn anytime. Having several different ones will allow you to mix and match and never get bored with these rings. We are also seeing a gorgeous trend in spin rings that are handcrafted in mix and match metals. Combining gold and silver interlaced with movement on a ring is a fabulous piece to wear. Some even look amazing enough to be selected as a wedding ring. They are certainly something that would make an impression. Many of these rings are created in a wide width to allow for the spinning portion in the middle, and are available for men and women. The mixed metals are amazing. Some are in hammered metal and some can be found smooth. Either way you choose your ring, it will be stunning. These timeless pieces will last you a life time and it will certainly be worth it. As long as you care for your jewelry and wear it often, these ring trends are wonderful items that you can wear forever and even pass them down to future generations. Opals are a delicate naturally derived stone. They range in the hardness scale between 5.5 to 6.5. What this means is that they are a relatively soft stone so caring for them is important to their long lasting luster. Here are some care tips that will help make sure your stones will last without damage. 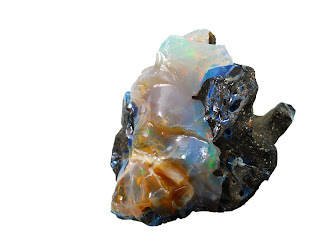 Opals contain water, normally up to 10% but can contain up to 21% water for the finer high-end opal gemstones. They are very delicate gemstones and must be treated carefully. We mainly see opals in rings and necklaces and sometimes in bracelets and earrings. The settings are usually pretty strong to protect the stone. Since they are a delicate stone, you should avoid getting perfume, cosmetics, hair products, etc. on your opals as these harmful chemicals can damage the stone and reduce the brilliant shine of your gemstone. Always put your opal jewelry on last after applying your personal products to protect your jewelry from the harsh chemicals. Should you need to clean your stones for any reason, make sure that you are very careful. To clean, you will want to gently rinse them under cool running water and use a very mild liquid soap if you need to remove any debris. Avoid scrubbing them with cleaning brushes or cleaning solvent of any kind. If you need to clean the settings, again, use only cool water and mild soap since any other cleanswer could seep through and damage your opals. Store your opal jewelry in a separate storage compartment in your jewelry box or in its own lined box without any other jewelry so the stones are not accidentally scratched. By following these suggestions, you will make sure your opals remain lustrous and beautiful for a long time. Enjoy wearing them with pride. Many people have health issues or life threatening allergies and are required to wear medical alert ID's on a continual basis. 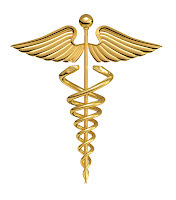 But as we are finding, medical alert jewelry doesn't have to be stuffy and boring any more. There are so many different styles that are fashionable and even trendy right now. Take a look at what is new on the jewelry scene for these types of ID jewelry. We have been seeing these on teens and adults. These are a great style because they can be worn with other necklaces to mix and match. These are available in gold or silver metals and are a nice option because you can have the front and/or back engraved with your medical information. In addition, this style is universal and would be appropriate for males and females. If you are a fan of wearing watches this style would be for you because the medical alert ID tag is attached to the center of a leather watch band and has an adjustable clasp. This style is unique and versatile because it can be integrated with other bracelets and become a lovely fashion statement. This style looks much like a metal chain bracelet, the only difference is the medical alert plate that is attached in the center. Often times you can get the front and backsides of the plate engraved with your medical information and this style is appropriate for both guys and gals. Chain bracelets are beautiful when stacked with other bracelets too. You can do a lot with the different metals of chain as well. They just go with everything. Obviously this style of medical ID bracelet is geared towards women who have a taste for trendy and chic style jewelry. If you are worried about losing your bracelet then a bangle or the cuff style is a perfect option. You will find this style of bracelet in all metal, combination metal/leather or metal with enamel. They come in multiple colors and look just like regular jewelry. These are great to mix with other bangles and cuffs too. All of these options allow the user to still have great style and not have to call out to the world that they have medical issues or life threatening allergies to medications. Stylish choices abound so don't limit yourself to just one style! Take care of them and keep them stored in lined jewelry boxes when they are not in use and you will have your lovely pieces for many years. Necklaces are very popular any time but this summer season we are enjoying two fun and unique necklace trends. Get ready to have a lot of fun with these great necklace trends that you are going to love so much you will want to carry them over to your fall wardrobe. Here are two favorite trends to check out. Feathers are in and all of the Hollywood and New York celebrities are sporting feathers! You can find faux and real feathers on necklaces and even feather pendants created from various metals like sterling silver, stainless steel and gold. The colors of these feather necklaces are amazing and you can really stand out from a crowd when sporting this trend. Solid print shirts and dresses are a fabulous backdrop to the stunning feather selectins in blue, greens and multiple other colors nature inspires. Heads will turn so make sure that you are ready for these great attention grabbers. Big, bold and chunky statement pendants are hot, hot, hot and the bigger your pendant.....the better! These gorgeous pieces have been seen crafted in assorted metals that hang off chains or leather cording. You can also find bib styles made with metals and other materials fashioned into a hanging work of art. Beautiful giant enamel pieces have been selling with fabulous bright colors creating eye catching pieces you will love to wear with your favorite dress. Stunning! Summer is a great time to enhance your outfits by making bold statements with your jewelry and the trends we have been seeing this year compliment summer styles beautifully! Take care of your amazing necklace collection with hanging jewelry organizers and protect your favorite pieces so they don't tangle or knot together. Have fun accessorizing your favorite outfits with these fantastic necklace trends from Summer 2011. A timeless jewelry trend worldwide, and one that has been gaining popularity in the US recently, is jewelry that has been made from various types of wood (natural or dyed) and then polished to a smooth, lustrous finish. You can find wooden hoop earrings, pendants, rings and bangle bracelets in a variety of styles and colors this year. This type of jewelry needs special cleaning care, so it is important that you take care of the wood properly to preserve the finish. On thing for sure is you never want to get jewelry made from wood sopping wet so always remove your wood jewelry before bathing, showering, and swimming. If you wear wooden rings, remove them before doing the dishes or washing your hands. If your wooden jewelry pieces get dusty or dirty, you will want to wipe them down with a slightly damped soft cotton cloth and dry them thoroughly. Once they are dry you can polish them with a soft cloth and a little mineral or olive oil to restore the luster to the wood. When using a commercial jewelry cleaner on your wooden jewelry pieces take care to purchase one that is specifically made for wooden jewelry as harsh chemicals and water will ruin your piece's finish. Once a wooden jewelry item has been ruined, it usually cannot be repaired to the original finish. Enjoying beautiful wooden jewelry from all around the world can be a great way to express your sense of style and creativity. Just be sure you know what materials you are working with when caring for your jewelry. A mistake can have tragic results. If you are unsure, testing a tiny area in an inconspicuous space may be the answer. Any discolorations or changes to the piece will mean that the cleaner is not right for your wooden jewelry. If this is the case, use a soft, dry, untreated polishing cloth on your wood jewelry to keep it dirt and dust free so you can enjoy the lasting beauty of your wood jewelry. Turquoise comes in varying colors ranging from blue, green and yellow-green depending on the chemical makeup of the stone. Turquoise is formed when water comes in contact with copper, zinc or aluminum. The more copper that comes into contact with the stone, the bluer the Turquoise will be. If the stone is in more contact with zinc then the stone will be more of a yellow-green color and if it is in more contact with aluminum it will take on a greener hue. When it comes to using Turquoise for jewelry, it usually ranges between 5 to 6 on the hardness scale. Because the stone is relatively soft, it is often treated with an epoxy resin to seal the stones pores. This allows the stone to harden up so it is able to be used in jewelry. Once it is treated, it is referred to as "Treated Turquoise". You can also buy "Natural Turquoise" jewelry that has not been treated in any way (other than cutting it and polishing it). Handling your Turquoise jewelry should be done with care. You will want to store it by laying it flat in a softly lined jewelry box. Never store jewelry in plastic bags that are not acid-free or made for jewelry storage. You want to keep your Turquoise jewelry away from harsh chemicals and hot water which can damage the stone's surface. To clean your Turquoise jewelry, you want to rinse them first under cool running water with a little mile liquid soap, rinsing completely and then towel dry with a soft cotton cloth. You should not use commercial jewelry cleaner on Turquoise jewelry. Most Turquoise jewelry is set in sterling silver and if your silver gets tarnished you can clean that separately with a polishing cloth. Enjoy your beautiful necklaces, bracelets, rings and earrings often now that you know a bit more about caring for natural jewelry pieces. Taking a bit of time to properly care for your treated Turquoise will mean that you can enjoy its beauty for a life time. One of the hottest clothing trends for the summer 2011 season is clothing that is embellished with crochet applique's and trim, and clothing that is trimmed in pretty feminine lace. We have been seeing it in dresses and beautiful flowing tops that are pretty as a picture. Here are some lovely jewelry pieces that will work well with the crochet and lace trims. Real and faux pearls in any color or style work fabulous with this summer's clothing trends. Try a pair of dangle pearl earrings in a pastel color along with a matching fringe style pearl necklace to dress up the lace. Faux pearls and real pearls that are dyed come in wonderful colors like lavender, pink, gray and black and will look lovely with your choice of fashionable top or dress. When wearing gemstone jewelry with this hot fashion trend, try to stick to faceted pasted colored gems like citrine, peridot, amethyst and aquamarine in lighter shades of those gemstones. Big thick chunky bracelets loaded with faux gemstones are all the rage right now and will look amazing with your clothes. Very feminine and fun at the same time. These are great to stack in multiples too! Women are sporting long flowy skirts and dresses this summer and many are showing off lovely ankle bracelets! You can choose to layer several delicate ankle bracelets together for a powerful look. This is a flash back to the bohemian style, but very fun and flirty too. To go along with the feminine clothing trend this summer, women are sporting big, bold floral rings! These rings can be in real of faux gems and the bigger, the better. These are a great addition to the crochet and lace trend and matching your color scheme looks so great with this type of clothing. As you can see, you can have fun with all of these great new styles coming out in jewelry. Mixing and matching your favorite pieces with trendy clothing is not hard. Take a moment after wearing your jewelry to clean it before storing it in your jewelry case. It will make wearing it next time quick and easy and preserve it for a long time. Is that small jewelry box on your dresser top starting to overflow? If you are faced with the problem of storing your jewelry in safe, uncluttered and eye-pleasing ways, then you will be happy to know that there are plenty of options for handling the overflow. This article will give you some practical suggestions on what to do. 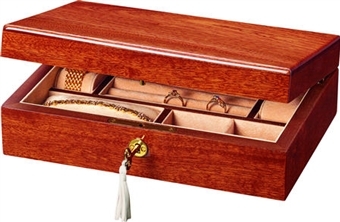 A simple solution is to purchase an additional dresser top jewelry box or jewelry storage case. And while you are getting another box or case you can take the opportunity to specialize your storage. 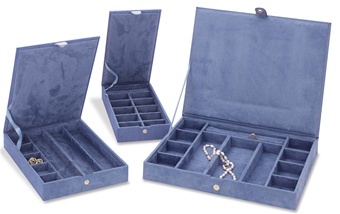 For example, you can move all of your silver jewelry into storage boxes with treated anti-tarnish linings. 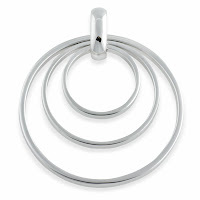 This will not only solve your overflow problem but will improve the protection to your valuable silver jewelry. Another way to gain more space for your jewelry is to organize all your earrings in jewelry cases designed specifically for earrings. Most earring cases will hold 24-48 pairs of earrings, but you can also buy more if your earring collection is large. You can even purchase different colored cases and color co-ordinate the earrings to help you remember which case to grab when you need a particular pair. Better yet, you can get clear topped earring cases which will give you "grab and go" organization. Where to put your necklaces can also seem like a challenge, but once again, there are some easy solutions to the problem. You can purchase a metal art wall-hanging in a tree or vine design and drape your necklaces over them to create a nice display and to make it easy to find your favorite. If it is quantity that is causing the overflow, you can upgrade to a larger jewelry box and hand down or donate the smaller jewelry box. If you are upgrading to something larger, then one of the best options is a floor standing armoire. 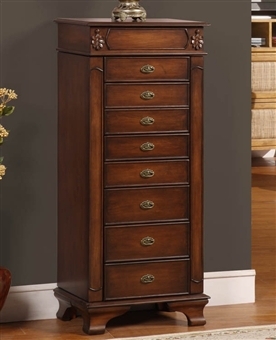 Unlike a jewelry box or case which sits on your dresser top, the jewelry armoire is a free standing piece of furniture. 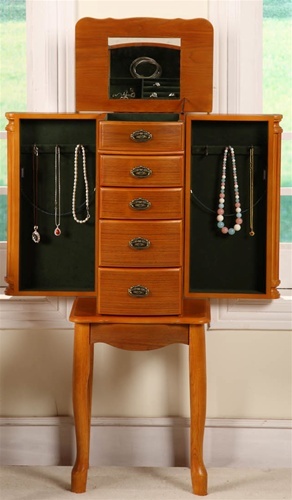 Armoires usually have drawers with special dividers designed to hold earrings and other jewelry, ring trays and hooks to hold necklaces and bracelets. If you purchase a large enough armoire, there will even be room for scarves and lingerie. If your jewelry collection is getting unwieldy then it is probably time for you to remove items that you rarely wear and store them in attractive jewelry storage cases. You can keep these cases in drawers and closets. If you do this then your jewelry will be organized and easy to find when you are ready for it. Another way to get your jewelry overflow off your dresser top is to move the excess jewelry to a hanging jewelry organizer. These organizers are usually stored in a closet next to your clothes. If some of your jewelry is particularly valuable and rarely worn, then you can move these items into a luxury locking jewelry box with a slim design that can be slipped into a safe. Your every day jewelry, on the other hand, can be put in attractive jewelry dishes next to your bed or vanity. Finally, you can also solve your storage problems by going through your collection and removing unwanted or broken pieces. You can hand down costume jewelry to children in your family who are starting their own collection, or you can give away family pieces that you don't wear. These will be sentimental gifts treasured by the other members of your family. If some of your excess jewelry is gold, then take advantage of the all-time high gold prices by selling broken chains, unworn items or mismatched earrings. You can then use this money to purchase the kind of jewelry that you want to wear often. 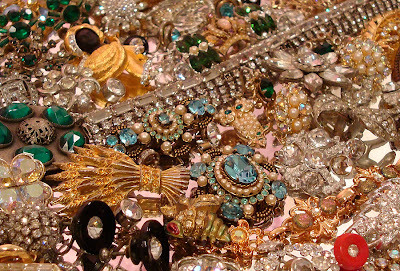 These are just some of the ways in which you can handle the challenge of storing more jewelry. Silver is so beautiful and we love wearing the jewelry. The problem is when it is not in use, it can tarnish. Making sure that it is not scratched is a priority so you need to be careful on how you clean real sterling silver, marked .925 pieces. Here are some cleaners that you can make to clean your silver inexpensively and without chemicals. 2. Purchase some Plain White Toothpaste (no gel or whiteners in it it) along with an old toothbrush. Rinse your jewelry under cool water and then place a tad of toothpaste onto the toothbrush and light brust the grime off of your jewelry. Rinse your pieces under cool water and towel dry. 2. Purchase a box of washing soda (found in the laundry detergent aisle) and lay a piece of aluminum foil on the bottom of a glass baking dish. Pour 3-4 cups of warm water and following directions on the washing soda box on how many teaspoons to add per cups of water to your container. Wait a few seconds and lay your silver jewelry in a single layer on top of the aluminum foil and let them soak for around 20 minutes or so. You will see the tarnish removed from the jewelry on to the foil. Remove your jewelry and then rinse under cool running water and towel dry. 3. You will need 1 cup of milk and 1 teaspoon of lemon juice mixed together. Dip your jewelry pieces into the mixture and use an old toothbrush to loosen up the grime. Rinse under water and towel dry. If your pieces are heavily soiled, let them soak in the milk solution for 10-15 minutes and then rinse and dry. These cleaners should take care of your silver jewelry easily. Do not use these on silver plated items. Much of the flatware you see is silver plated and all sterling is marked .0925 or 92.5. By using any of the homemade household cleaners, your jewelry is ready for wearing quickly. Restore your old sterling jewelry easily and enjoy wearing your old beautiful pieces often. It is fun to watch new jewelry trends that come out each season. Some are great for adults and many focus on teens. Teen girls typically have a lot of discretionary cash and they love spending it on accessories and fashion. This is great for the manufacturers and stores that carry teen focused items. Some of the great items that we are seeing this summer are created with beads; small, medium and large sized beads. What is so great is that the beads come in such a wide array of colors, you can mix and match to any design and style that you want to. Some of the fun uses of working with beads we have seen are the tiny beads strung on elastic cording and then working into long necklaces. These can then be worn by wrapping them multiple times around your wrist. You can wear them as anklets and even as a belt or decorative item for your waist. Another way we are seeing beads in action this summer is by wearing 3 or more bracelets on one arm and stacking them one on top of another. The splashes of color are remarkable and by bringing in different sizes of beaded bracelets you can really make a statement and enhance your awesome outfits. Beading is also seen in wonderful necklaces that are created on a piece of fabric called a bib and then sewn onto cording to create your necklace. 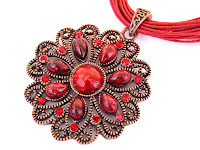 These designs are intricate and just a fabulous fashion accessory. This has been seen on high fashion models this season and adult women are snapping these up as well. You can also find other beaded items such as rings, watches and hair accessories that would be great to add to your jewelry box. By keeping an array of colors and textures available to wear at a moment's notice, you will always find the perfect jewelry piece to wear with your outfit. Beads have been popular for many years and are making a comeback in a major way with the different textures available. Plastic, glass, resin and even paper are being used to create these fashion pieces. Handmade pieces are readily available and the beauty of the beads makes beaded jewelry a real trend for this season for teens and adults alike. Most commercially produced jewelry cleaners are safe for your jewelry provided the instructions are followed and care is taken to use the appropriate cleaner on the recommended type of jewelry and gemstones you are cleaning. Some commercially produced jewelry cleaners can be very harsh on your precious and costume jewelry. With that said, we hunted down some recipes that you can use to clean your own jewelry with and know that it is safe and your lovely pieces will not be damaged. There are two different recipes below for different jewelry pieces. Recipe Two: If your rings are like mine, they are exposed to hairspray on a regular basis. This is a very safe and simple natural process to clean your jewelry pieces. Take 1 cup of hot water and add in 1/2 tsp of natural liquid soap. Let your pieces soak and scrub them lightly with a soft brush after soaking, rinse and buff with a soft cloth. Take care when cleaning your jewelry. If you are not sure of what it is made of, clean your piece by hand with a bit of hot water and a cotton swab. Do not submerse any pieces that are old, contain a backing of foil or that are hand strung like beads or pearls. By using natural ingredients in your cleaning mixtures, you will lessen any chemical reactions that may occur, but always use the safest route when it comes to your precious pieces. There are so many fun trendy jewelry items out this summer. Some of them are fun, casual items but many of them are for those great evenings out for some fine wine, dancing and the theater. So what to wear to accessorize your little black dress for a glitz and glamour effect? Lately we are seeing a lot of glittery and sparkly stones that when they hit the light it look like you are wearing 10 carats of pave’ diamonds. You can find this in fabulous 2-3” long dangle earrings that just shimmer and shine. These are perfect if you have long hair that you love to wear down. These earrings will fall against your hair and look amazing. If you wear your hair short or pulled back, you can wear the dangle earrings still, but also hot are the huge hoops that are encrusted with the rhinestones or crystals. These are an amazing look too and you can find them in small 1” hoops or up to 4 and 5” hoops. The metals used can be either gold or silver. If you opt to not wear large earrings with your little black dress, long glitzy necklaces are still in fashion. Grab one with all of the sparkle effects too. Mix and match a hammered silver necklace with a clear crystal necklace or two and you cannot imagine the light shimmer effect. Pair this with some smaller simple earrings or a glittery bracelet and you will look awesome. One thing to remember when wearing huge pieces or ones that have a reflective action about them is less is more. You do not want to wear huge earrings and a necklace and a bracelet that all sparkle and shine. Pick and choose what you feel the most comfortable with. You can also dress it up with a shiny fabric little bag or clutch too. So go on and have some fun on your next night out with some glitz and glam jewelry. You'll look great! Caring for your jewelry whether it is antique, vintage or brand new is basically the same type of care. It only takes a few minutes to make sure that your rhinestone pieces are bright and sparkly just like when they were new. Here are a few tips to care for your favorite rhinestones easily. Rhinestones are usually made from glass or crystal and come in clear or colored stones. They contain a foil backing so that the light reflects into the stone and that is what makes it flashy. Without the foil, you would have just a boring clear stone. Since the foil backing is under the stone, these can never be submersed in water or the stone will come out looking dark. To clean your stones, you will want to take an old soft brush, like a makeup brush, and use it to loosen the dirt under the settings. Another option is to use a can of compressed air. Use a very soft cloth and dampen it slightly with water and wipe off the stones. If there is still dirt, you can use some rubbing alcohol and a cotton swab and lightly brush the stones down and then wipe it clean. Take care when using the water or alcohol to not get the stones too wet. You should never resort to a commercial cleaner for cleaning your rhinestones. It will damage them. Allow your piece of jewelry to dry completely before storing it. Polish your rhinestones with a cloth every so often to keep the dirt off and keep them looking bright and new. Old rhinestones that are signed can be worth a good deal of money so taking care of them is important for your investment and your pleasure in wearing nice, clear stones. As with other jewelry, rhinestones can be scratched from other pieces or because of the heaviness of these items, they can actually damage softer jewelry you may own. Store all of your rhinestones away from different types of stones to preserve the quality of your jewelry. A jewelry box with compartments would be perfect in this instance. By using these tips for the care of your vintage, antique or new rhinestones, you will be able to enjoy your rhinestones for a long time to come. Keeping your rhinestones in good condition will help to ensure that you can someday pass down prized pieces to your children and they too can enjoy the beauty of the rhinestone. During the summer when clothing is light and airy, your jewelry styles can make a big impact for you and your style. What is fun to wear for this summer season? Here are 4 ring styles that are trending right now that you can use to spice up your style for summer fun! Make big statements with minimal jewelry. Big Bold Cocktail Rings ~ Big is beautiful this summer. These cocktail rings can be in real or faux gems, porcelain, over-sized cameos or big bold gold or silver. Look for beautiful colors and unusual designs to make an big impression. When we say big, the bigger the better! Knots and Buckles Rings ~ These are a classic and we have seen them before but they are big again this summer! You can find them in sterling silver, gold or stainless steel. They come in small, medium or larger styles and you can make a beautiful impact with a ring like this. These are fun styles that work well with nautical themed clothes that are seen often in summer months. Floral Rings ~ Big floral rings consisting of real or faux gemstones are being seen this summer. You can find them in one bold, bright gem color or a rainbow of colored gems in sterling silver or gold. These are bright and colorful and can really brighten up your style this summer. Tropical Rings ~ The tropics are always in style in the summer time. Look for tropical designed rings featuring pearls, mother of pearl and other sea related gems. You can find beautiful blues and greens reminiscent of the sea and the tropics that will have you dreaming of escaping to the seaside. Pairing these colors with beautiful summer dresses will put you at the top of the style list. Summer is a great time to try new and fun designs and bright, bold colors that you normally may shy away from. Next time you hit the stores, check out the awesome colors and designs. When you go on vacation, grab some local colors and styles made by local artisans. Have some fun and try a few new ring trends this summer! You can make a big impact with a few pieces and spice up your style at the same time. The beauty of the cultured and the freshwater pearl is the natural luster and shine. Preserving that luster is easy when you properly care for your pearls. Here are some tips on how to care for your pearls so that you get the longest usage out of them so as to enjoy for many years to come. Whether you have genuine cultured pearls or semi-precious fresh water pearls, they are a natural stone that can be easily damaged. Never allow your pearls to be in contact with sweat, vinegar, hairsprays, cosmetics, perfumes, bleaches or anything that is not natural in nature. Before and after you wear your pearls, wipe them with a soft, damp cloth to remove any oils or dirt that can occur when wearing your pearls. Using any type of commercial jewelry cleaner will damage your pearls so only use fresh clean water when wiping them off. Pearls are also very fragile and can easily be scratched by other hard gems such as diamonds and settings from rings or clasps from necklaces. Store them in a soft pouch; wrap them in a soft cloth or individually in a jewelry box in its own lined compartment. Take care to keep the clasp away from the pearl. Since pearls are a natural organic gem, they need air and moisture so they do not crack, therefore never store your pearls in a plastic bag or any sealed bag or box. When wearing your pearls, put them on after dressing and applying any makeup so that they do not come into contact with any other chemical additive. Also make sure to remove your pearls while you are exercising as perspiration is caustic to a pearl. If you love your pearls and wear them often, as you should, they will continue to have the beautiful shine and luster that makes the pearl a favorite gem of many women. When caring for your necklaces, check the silk cord often for damage and wear. You should have them re strung on a yearly basis to insure that they remain safe and the knots between the pearls remain taut. Pearls have been a classic staple in women's jewelry for years. Caring for your pearls only takes a few additional steps but taking he time to maintain and treat your pearls well will bring you many years of beauty to enjoy. Summer 2011 has some beautiful jewelry items that are hot this summer and earrings are always tops on the list. Here are two fashion favorites to look for when the hot weather heats up and you still want to look fabulous without over doing your accessories. Drop earrings are hot this summer, especially when those drop earrings measure 1-1/4" to 2" in length. These are wonderful to wear with the fabulous dresses that are out this summer and can really make a difference in your fashion statement. You can find these amazing drop earrings in bright citrus colors that are on fire this summer, especially yellow, pinks, corals and blues. Look for faceted real and faux gems that have a glamorous or upscale appearance. The more glitzy and glamorous, the better! Feather style earrings are one of the hottest styles going this summer and the longer, the better! Celebrities have been spotted sporting 8" to 12" long feather earrings! You will find feather earrings that are just plain or some that have beads and charms dangling off them so look for some that are light and airy in their appearance. You will want to stick with the neutral colors like white, ivory, cream, beige and browns for the most usage although there are beautiful blues and greens that will fascinate the most picky shopper and accessory lover. Pairing these earrings with amazing summer colors that will make them pop is a fashion plus. Both of these selections are a great choice for summer wear. Bright bold colors are always in style and the gemstone earring can really set off a lovely outfit and make a fashion statement. The feather earrings are perfect for more casual clothes, but they can also be dressed up too. Both earrings are ones you need to keep on hand for amazing summer outfits and outings.